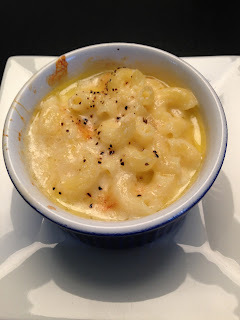 I've been in search of a good mac-n-cheese recipe for quite some time now. The kids used to love when I would make California Pizza Kitchen's recipe but I just came to a point where I couldn't use the Velveeta that it called for anymore. I came across Nigella's recipe on GMA for mini macaroni & cheese recently and of course I had to try it. It calls for Gruyere, Mascarpone, Mozzarella & Parmesan which are some of my favorite cheeses. It was a little runny...should have let it cook longer but the troops were hungry around here! Or maybe I didn't let it set long enough after it was finished cooking. Who knows...but I do know that I will give it another shot. Looks good! We'll give it a try! I've made this one before. It doesn't use "fancy cheese" but it is simple and Logan loved it. Yours sounds good too. will have to try it. Thanks Karen! I am def going to try this!!!! Especially because it has Jack cheese!!! Yum! Mac n' cheese is always a good idea. There is a restaurant in Sugarland that is ALL mac n' cheese! It has some delicious grub. I had no idea Lisa! We'll have to check it out!